At a time when its systems have come under increasing threat of cyber attack, and the concept of the military alliance itself has been questioned by the American president, NATO has pushed forward with a major IT infrastructure upgrade. 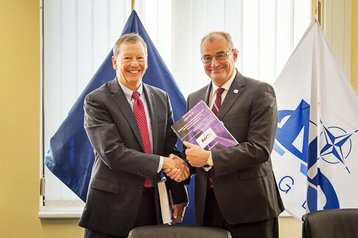 As part of a larger effort to overhaul and modernize the intergovernmental military alliance, General Dynamics Information Technology (GDIT) has been awarded a contract with the NATO Communications and Information Agency (NCI Agency) to provide cloud and IT services in a deal that could be worth as much as $140 million over five years. “General Dynamics is honored to have been selected to deliver this mission-critical project for NATO,” Bernie Guerry, SVP of GDIT’s intelligence solutions division, said. Last year, the company was awarded a similar $184 million contract with US Army Europe. The first $85 million phase of the project includes the delivery of new data centers in Mons, Belgium and Lago Patria, Italy, by September 2018. NATO says that the facilities will deploy hyperconverged solutions from Dell, based on VxRail technology. In a separate contract, Bechtle AG will supply client equipment and accessories throughout NATO offices in partnership with Dell. Defense tech company Leonardo (formerly Selex ES) will “adapt existing nodes and install new nodes to protect and secure" the two new data centers. In future phases, GDIT will build a data center at NATO’s headquarters in Brussels, along with further 'enhanced' and 'standard' nodes. The IT Modernization (ITM) program originally opened to bids in 2015, holding a conference that attracted 150 representatives from 70 companies. 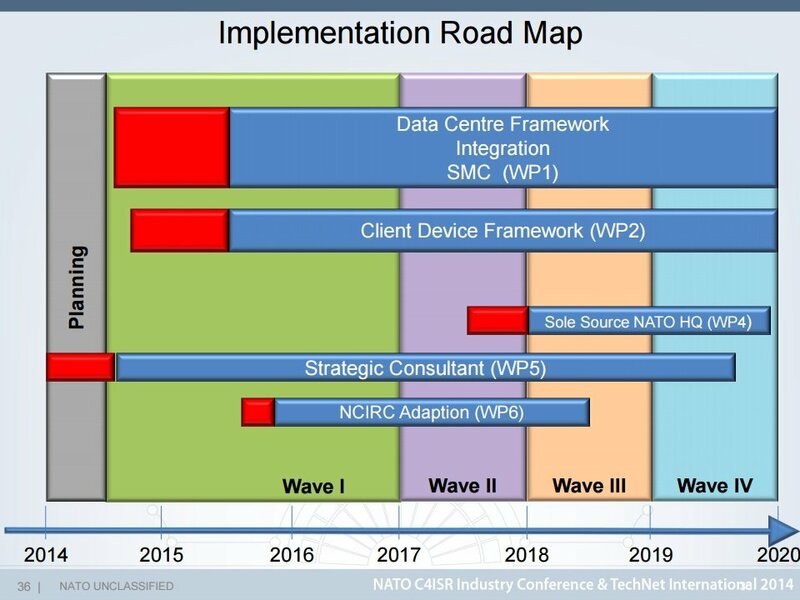 In an unclassified 2014 presentation made at the NATO C4ISR Industry Conference & TechNet International (NITEC'16) event in Romania, Dr Peter Lenk, Chief of the IT Modernization Task Force, laid out the current state of affairs at NATO. The way to combat this sprawl, Lenk said, is a data center consolidation initiave in the form of the ITM program. It will involve “centralization of services in data centers,” which could deliver “up to 80 percent centralization of applications by the end of wave 4,” expected in 2020. 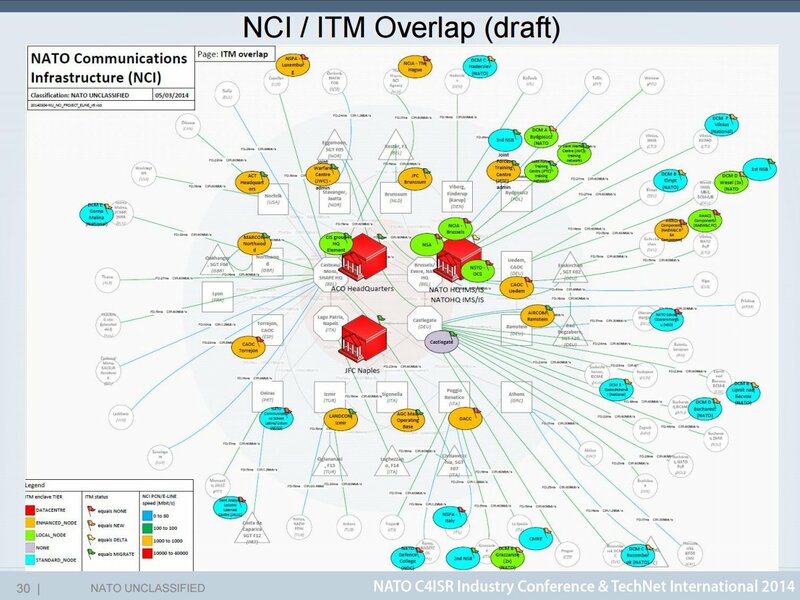 Some of the ITM initiative overlaps with another project from the alliance, the NATO Communications Infrastructure (NCI), which also opened for bids in 2015. Through an €80 million ($85m) contract, it seeks to replace much of the NATO General Communications System (NGCS) across at least 73 sites. “It will provide a major upgrade of the wide area protected IP communications across the NATO Command Structure (NCS), NATO Headquarters (HQ) and NATO Points of Presence (PoP) in NATO member nations,” the organization said. Both General Dynamics’ $140m deal and the NCI contract pales in comparison to what is still up for grabs. Earlier this week, NATO announced that it will put out 40 contracts in the next 18 to 24 months as part of a €3bn ($3.2bn) tech refresh. 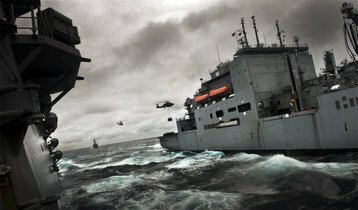 Speaking on the importance of Satcom to Via Satellite, NATO director of infrastructure services, Gregory Edwards, said in 2015: “We are seeing an increase in the use of deployed satcom for military communications as well as commercial through what at NATO we call the functional application services. When we have forces deployed, they may go with short to no notice. It is difficult to plan your telecommunications needs when you don’t know where you are going. Sponsors and exhibitors include General Dynamics, AWS, VMware, CenturyLink and IBM. NATO was set up as a collective defense system in 1949, ostensibly to promote peace in Europe, but increasingly involved in containing the expansion of the Soviet Union. The Soviet collapse only temporarily changed matters, and NATO has since become a source of much consternation for Vladimir Putin’s Russia. It is believed that Russia has sought to check NATO’s larger military forces through cyber attacks, gaining vital information and potentially critical access. Since then, tensions between Russia and NATO have only escalated, with 2017 marking the biggest US and NATO arms buildup on the European continent since the 1980s. Russian troop levels have also risen on the border. Should conflict arise, it is possible that it will be limited to the cyber battlefield. A recent Northrup Grumman white paper notes: “In the future, it is conceivable that a widespread cyber-attack could simultaneously strike a combination of civilian critical infrastructure and allied military targets on a scale that would make it impractical to determine the source of the attack, much less determine an appropriate response. Tillerson’s comments were seen as an effort to assuage fears that the new US administration had a dim view of NATO. Prior to his election, Donald Trump suggested America would only come to a member state’s aid “if they fulfill their obligations to us.” He has since made repeated comments about NATO members not spending two percent of their GDP on the military, as required by NATO goals. Another cause for concern is the potential ties between Trump advisers and the Russian government, with several congressional committees, the FBI and the US intelligence community investigating the Trump campaign’s alleged connection to Russia. Earlier today it was revealed that Michael Flynn, President Trump’s former national security adviser, asked for immunity in exchange for testifying in Congress’s investigation.